In 2009 Top Gear team were sent to Romania to drive along the Transfagarasan highway. 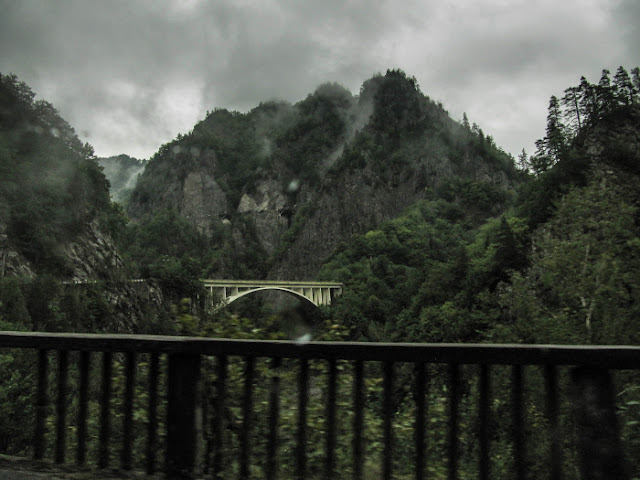 It was named THE BEST ROAD FOR DRIVING IN EUROPE. The episode was aired in Bulgaria a few months ago and I got inspired to take some amazing pictures there. It is quite a hilarious episode. If you have watched it - you know what I mean. If you don't wanna watch the full episode - go to the last 15 minutes to see the splendor of the Transfagarasan. 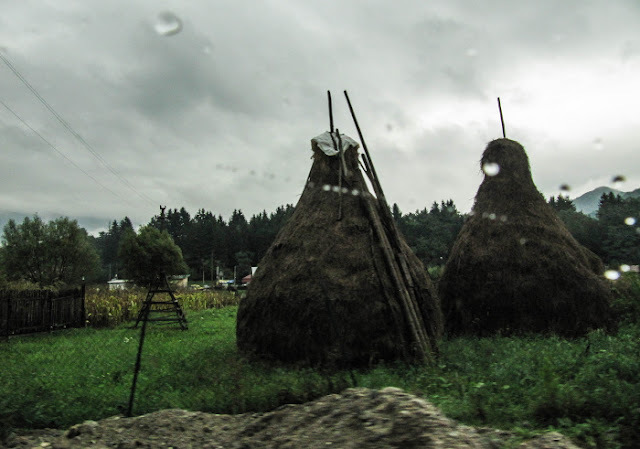 It turns out that there is no point in waiting and since the Transfagarasan is the shortest route to our next destination - Hunedoara (which I'll describe in another post) off we go down the road and say Goodbye to Curtea de Arges. 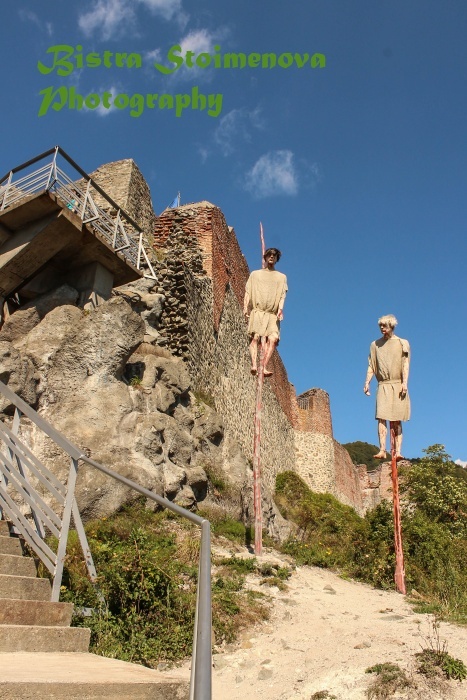 It is a nice tourist town at the foot of the Transfagarasan, full of tourists and places to eat and sleep. Also it is a few kilometers away from Poenary Castle (or Cetatea Poenary in Romanian) - the fortress of Vlad Tepes, commonly known as Vlad The Impaler (or Vlad Dracula if you have read Bram Stoker). 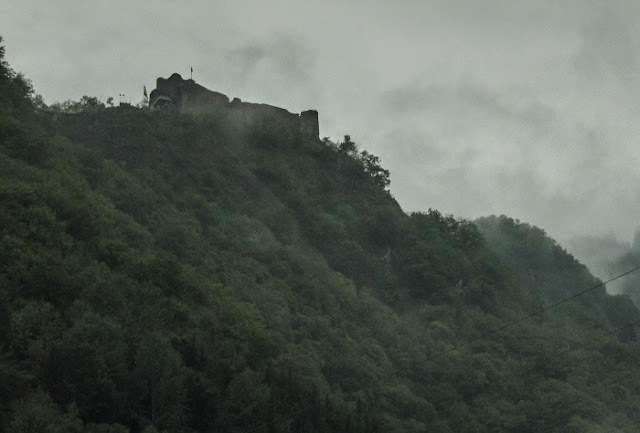 Here is what I saw that day of Poenary Fortress - don't wonder if the image quality is poor - it was REALLY a very rainy day! So welcoming, don't you think? The first 50 kilometers of the road are not very good - there are no holes in the asphalt or something, by Bulgarian standards it is rather uneven. The driver already starts making remarks of how easy the drive has been so far. I try to take a few pictures of the surroundings because the rain has lessened. 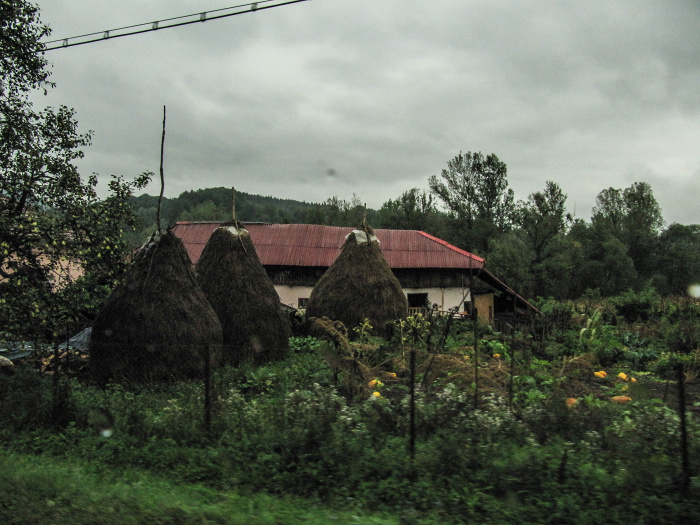 There are a few really picturesque villages along the way from Curtea de Arges - you just expect to see Cinderella walking out of some of them. By Bulgarian standards (no offence to the people in the ministry of transport but quality standards for a road in Bulgaria differ significantly - and better than in our neighbouring countries) the road is actually PERFECT - wide lanes - I mean wide two buses can freely drive past each other - the road markings are good and new, there is even safety fencing here and there (as in the picture below - normally on each steep curve or viaduct). See the dots - you guessed right - that is rain! And, I almost forgot, a lot of milestones - due to the rain I couldn't take a picture of any of them but they are there and they are many. The s curves start getting tighter - here is one of the many viaducts. The spots you see on the picture are rain drops. By the time we got to that point - it started raining more. 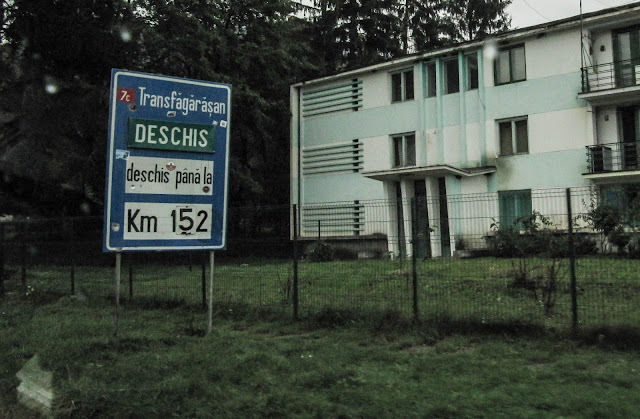 If you come from Curtea de Arges, as we did, the milestones will show you the distance to the nearest landmark which, paradoxically, is not a town but a lake - Balea lake ( Balea lac - read like 'latch' in Romanian). The lake marks the highest point (2,034 m of altitude) of the pass. Distance to it from Curtea de Arges is around 80 km but don't worry - the scenic curves start around 30 km before the lake itself. 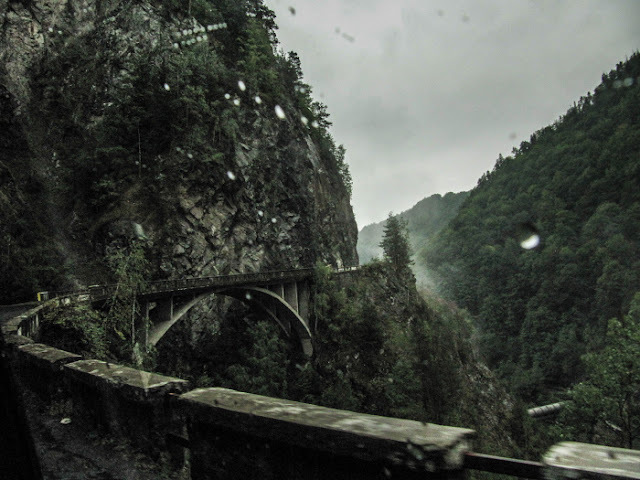 When the milestones start telling you that Balea lake is some 50 kilometers away, you'll pass a few viaducts above the Arges river - like the ones on the pictures above - and a tunnel and then you'll see the road widen. many cars just pull over even before you can identify the reason why. 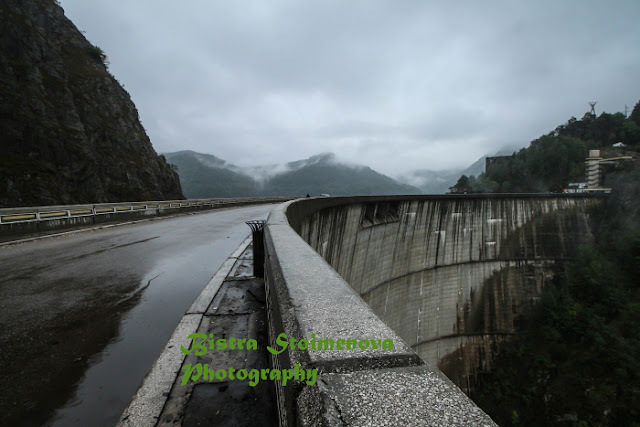 Then you'll see the reason with capital R - you have reached one of the landmarks on the road and one of the most famous in Romania - Vidraru dam. The lake it creates is (I think) the biggest dam in Romania and probably the most scenic one. The total surface of the lake is 3,930,000 sq m, 10.3 km in length, with a maximum width of 2.2 km. It was originally built as a hydroelectric power plant but in order to ensure that if the wall cracks for some reason it would not flood the cities downriver, dynamite was installed in the rocks around it so that if necessary it could be detonated and the natural lake would keep the water in. It is a beautiful place - especially when it is NOT raining - so I ask the driver to pull over. Even with the rain, I head out to take some pictures because the view is breathtaking. In fact some parts of one of the James Bond films was shot here. - Whatever camera you are using - you'll need the wide angle part of the lens (that means the one you are using when you shoot landscapes - if it is a compact camera - set it to Landscape mode). I. as a highly motivated photographer, took a DSLR and a 10-18 mm wide angle lens. Trust me, 10 mm (the wides wide I had) was what I was using 99% of the time. The landscape is so breathtaking that you just want to capture as much of it as possible in one pic. - Clean the windscreen and all other car windows because you have a 99% chance of wanting to take a picture of something while in motion. I got away with that by simply opening the window but I had no other choice because of the rain - all windows were in water droplets. - If you want to - like me - take pictures despite the rain, definitely take some DRY paper wipes (NOT wet wipes or a cloth - they'll be unusable after several minutes) and a lens pen (you'll be using the brush part, not the smudge cleaner part - mainly to brush away the particles left by the paper cloth). - Warm clothes - no matter what the temperature outside the pass is, up in the Transfagarasan is always chilly if not cold. 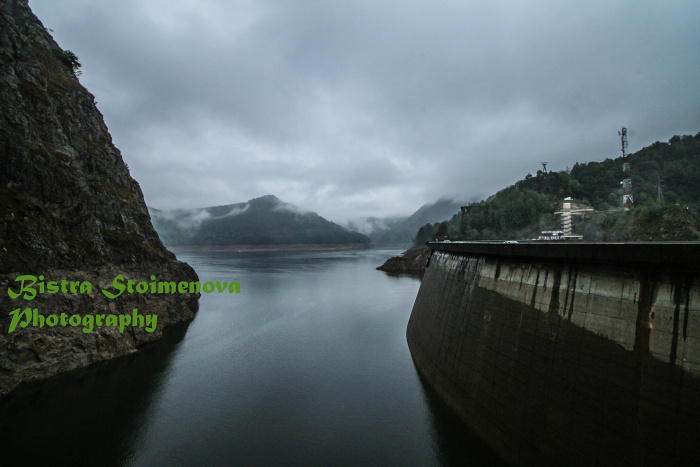 When we were at the dam the outside temperature was around 10 -12 degrees Celsius (in September). OK, back to the story then. 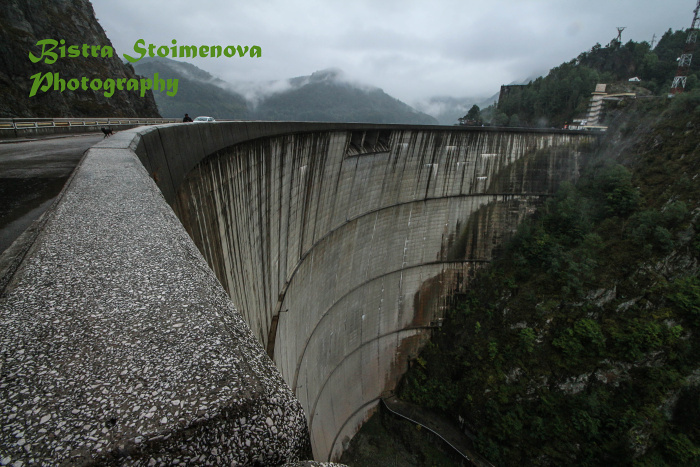 The road passes on the wall of the dam itself but there are pavements for those who want to walk around it. It is a BUSY road so look both ways BEFORE you cross. If you have enough time I definitely recommend walking around. 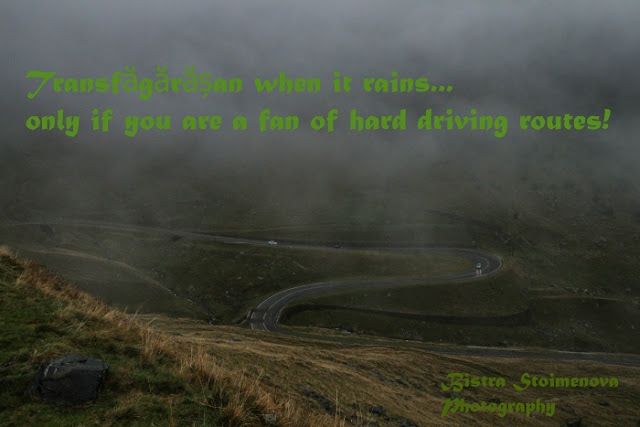 In my case, even though I had an umbrella, it took 5 minutes to get the lens and myself soaking wet so we drove along. After you cross the dam wall, you'll be able to pull over at several places - we didn't because we couldn't see anything anyway but if the weather is good (I'll keep repeating that) you'll be able to enjoy an amazing view of the dam so don't miss it. After the dam there is one more hotel with great view of the dam and the pine wood and then off we go to the real serpentines. Since the post is getting longish - I'll write about the real stuff in the next one. Posted by Bistra Stoimenova at 18:36 ч.